If you like soup and sandwiches for you meals then this Doctor Who set could be just what you need. 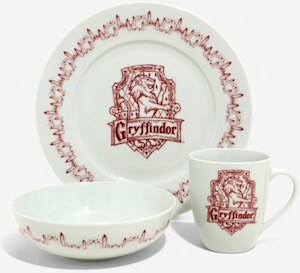 The set includes a blue plate with on it a galaxy and vortex and besides the plate there is also a soup bowl that looks like the Tardis and that has a lid on top to keep your soup warm. The plate and soup bowl are made from ceramic and are dishwasher and microwave safe. 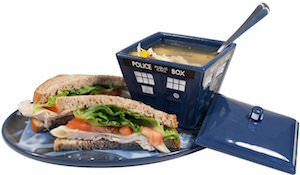 Just imagine having you soup from the Tardis and a sandwich on a plate even the Doctor would like to eat from.